Nothing gets you more prepared for game day than our premium selection of Marquette Golden Eagles apparel and merchandise! 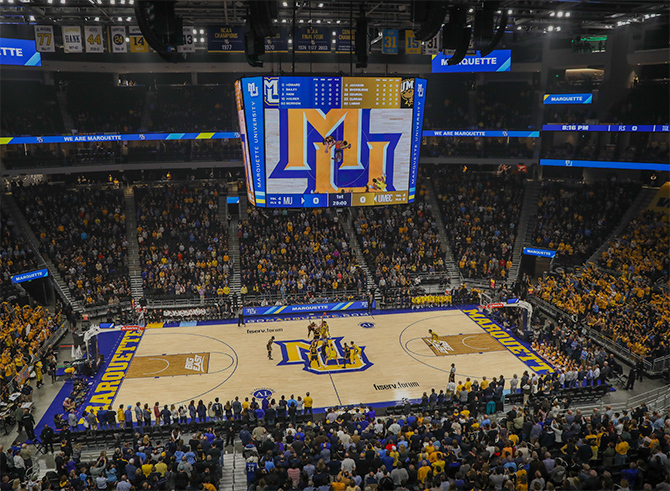 Whether you’re a student, alumni or just a die-hard fan, showing off your blue and gold pride has never been easier with our selection of top-quality Marquette athletic apparel and Marquette gear. Shop everything from hats and sweatshirts to backpacks and more at low competitive prices and find exactly what you’re looking for in just seconds. With so many Marquette clothing products to choose from, piecing together the perfect game day outfit is easier and more fun than ever before! All of our Marquette University apparel is available in multiple sizes and iconic styles for men, women and children, so the whole family can cheer on the sidelines in style all season long. Stay cool during summer in our selection of tees, jerseys and shorts and bundle up as the Golden Eagles chase Big East championships in our wide variety of cold weather gear, including jackets, sweatshirts and hats! No matter what type of fan you are, our Marquette store and gift shop has everything you need to show off your school pride.